Who doesn't want to be the best at what they do? This is something everyone should strive for and is most likely the reason why they do what they do. Anything from tennis to mixed martial arts requires a passion and a desire to achieve greatness to become the best of the best. This passion and desire is so strong that the idea of taking substances to increase physical performance doesn't seem out of the question. In fact, in most cases it seems inevitable. Most all sports are littered with PED users and abusers. Media attention has focused almost entirely on PED use by elite athletes to illicitly gain a competitive advantage in sports, and not on the health risks of PEDs. There is a widespread misperception that PED use is safe or that adverse effects are manageable. 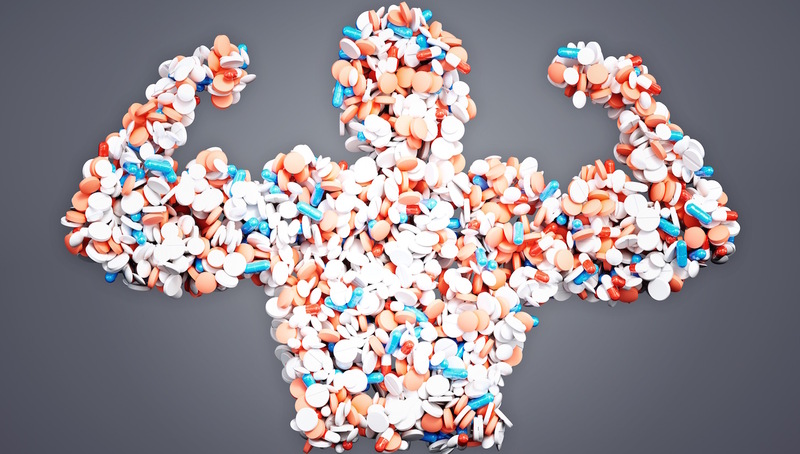 In reality, the vast majority of PED users are not athletes but rather non-athlete weightlifters, and the adverse health effects of PED use are greatly under-appreciated. PED use has been linked to an increased risk of death and a wide variety of cardiovascular, psychiatric, metabolic, endocrine, neurologic, infectious, hepatic, renal, and musculoskeletal disorders. If that wasn't bad enough, PED users frequently consume highly supra-physiologic doses of PEDs, combine them with other PEDs and/or other classical drugs of abuse, and display additional associated risk factors. So, what exactly are these PED's anyway? PED's are pharmacologic agents that athletes and non-athlete weightlifters use to enhance performance. The term doping refers to the use of PED's in competitive sports. There are several categories of PED's that are currently popular among non-athlete weightlifters and athletes. Lean mass builders, the most frequently used PED's, are generally pro-myogenic (anabolic) drugs that increase muscle mass or reduce fat mass. By far the most prevalent illicit drugs in this category are AAS's, which are the primary focus of this report. Among non-athlete weightlifters, the use of AAS's represents a higher proportion of overall PED use than that of all other categories of PED's combined. The World Anti-Doping Agency (WADA), an international agency that oversees the implementation of the anti-doping policies in all sports worldwide, maintains a list of substances (drugs, supplements, etc,) that are banned from use in all sports at all times, banned from use during competition, or banned in specific sports. WADA's Anti-Doping Program is based on the WADA Code, a universal document that contains comprehensive guidelines for best practices in international and national anti-doping programs. WADA also publishes the doping violation thresholds for banned substances. Don't worry! If you want to increase your performance but don't want to risk the negative health effects of PED's, like increased risk of death, a wide variety of cardiovascular, psychiatric, metabolic, endocrine, neurologic, infectious, hepatic, renal and musculoskeletal disorders or you don't want to fail a WADA anti-doping test in your sport, mother nature's natural alternatives can take your performance to that next level! Many of mother nature's powerful superfoods and superherbs have been used for centuries by many cultures. With an Ancient history dating back over 5,000 years, Ginseng has long been known for its stimulating effects. Chinese and Japanese warriors used the herb to promote endurance, circulation, and mental focus. The Vikings and Ancient Greeks cherished Rhodeola Rosea for its ability to increase mental acuity and its invigorating effects on the battlefield. The Ancient Incan Civilization revered the Maca Root for its energy and stamina enhancing properties. Indigenous to the Amazon, the Acai Berry is well known for boosting energy, mental function, and cellular health. Rich in antioxidants, amino acids, polyphenols, vitamins and minerals, Yerba Mate is known to increase mental and physical endurance and promote cardiovascular health. Discovered in China, Cordyceps Mushrooms have a long list of health promoting properties. Record breaking Chinese Olympic athletes swear by its ability to enhance athletic performance. Also known as Siberian Ginseng, this herb is utilized for its stamina and endurance promoting properties. Soviet Olympic Athletes swore by the herbs efficacy. These are just a small few of the many time tested superfoods and herbs that have been utilized to promote performance. Since the dawn of man, warriors and athletes have utilized the power of mother nature to fuel themselves in battle and competition. That's why here at Organic Muscle we have harnessed this ancient wisdom of powerful herbs and superfoods to bring you the world's first Pre-Workout formula to pass the strenuous regulations and certification process in order to become USDA organic certified. This pre-workout formula contains all those time tested herbs and superfoods that I mentioned, plus a few more! This pre-workout was rated number 1 by RaveReviews and is used by many professional athletes like those on Team Organic Muscle! This supplement has sold out many times and has a 4.5 star review on Amazon! It comes it three great flavors, Lemon Berry, Pineapple Coconut and Passionfruit Guava. So, if increased performance is something you are looking for without the use of PED's, you'll want to hurry up and order our Organic Pre-Workout before it sells out again. Now you can truly boost your performance naturally, the way mother nature intended!